Well today was much smoother than yesterday, though maybe not for the mama, papa and 2 almost newborn puppies I found in the middle of the road. They were near a house, but somehow I got the feeling they were dumped there. I felt so sad…I certainly couldn’t house 6 of them and had no clue where a vet or shelter would be. I moved them to the side of the road and left them some food. I hope someone took them in! My first stop on the route today was Pedestal Rocks. My Reader’s Digest Scenic Drive book explains that “natural forces – millions of years worth – have carved the rocks so that large boulders are upheld by pillarlike ones” and that the trail is one mile long. It sounded pretty cool to me and “dog doable”, so off I went. Pedestal Rocks is located in the Ozark National Forest. The National Forests are more rugged than the National Parks and State Parks. I pulled up and VANilla was the only car in the dirt parking lot. As I approached the trail marker, a sign cautioned “Bears may frequent this area.” My mom will be happy to know I carried along my bear mace, though I think the tags on my dogs’ collars jingle enough to scare the bears away. The trailhead sign also showed a 2.2 mile hike (not 1 mile), a little long for the dogs, but it was the first hike of the day and somewhat cool, so I decided they were up for it. The only other items of interest at the trailhead were some “walking sticks” that looked like people had picked up and then left them at the end of the day. I kind of wondered why in the world you’d need walking sticks for this trail. I soon found out. In my opinion, they weren’t for walking, they were for knocking down cobwebs!! I’m not exaggerating when I say I walked through at minimum 50 cobwebs. You could not suffer from arachnophobia and do this hike. Spiders were everywhere (Speaking of spiders, a daddy long legs crawled across my shin as I was driving today…I nearly wrecked, it scared me so badly!! I hope it doesn’t join me this evening). After about 30 minutes, I arrived at some rock ledges that overlooked a treed area and my first thought was I walked though cobwebs and sticker brush for this?!? It was pretty, but not what I was expecting. There happened to be a geocache in the area, so I walked a little farther, while keeping in mind that the brothers I met yesterday told me, “Be careful as it is easy to get lost if you stray from the trail.” It was worth straying a little…rock caves, huge boulders…really cool. Originally I was planning on and out and back hike to the cache to keep it short for my old mutts, after seeing these rock formations, I continued following the loop to admire pedestals, an arch rock, and trickling waterfalls down sheer cliffs. The second part of the loop made this a fantastic hike! I’d love to go back and explore a bit more and maybe have lunch on the rock ledge. My next stop was Alum Cove Natural Bridge Recreation Area. It is located in the Ozark National Forest as well. According to Reader’s Digest, “the combined actions of wind, water, and gravity transformed a huge mass of sandstone into an imposing natural bridge” – 130 feet long, 20 feet wide – and you can walk across it. I checked the map at the trailhead…it looked like the natural bridge was 1,000 ft or so down the trail, so I kept the dogs in tow. I walked across the bridge and took a picture from the top looking down toward the mountain where a cave was sort of carved in the stone from the water to try to try to show how it was formed, but a photo looked like it would require bushwacking. From Alum Cove Natural Bridge Recreation, I drove to the overlook for a view Arkansas’ “Grand Canyon” as pictured below. Slightly different from Arizona’s I’d have to say, but nice none-the-less. I also passed through Jasper, a cute little town worthy of a picture and stopped at a couple of different historical markers along the route. One historical marker indicated the place where the marble for Washington’s Monument was taken in 1836. The other marked the starting place of an ill-fated journey to California for 150 people. With the exception of 17 children, all were massacred in Utah by Mormons disguised as Indians. The brothers at at Long Pool two days ago suggested I visit Buffalo National River. My Reader’s Digest Scenic Drive book said the same. Instead of driving the suggested 14 miles to Ponca on roads that are built to go over the mountains rather than through them which I estimated to take at least an hour to get there and back, not counting finding a place for a walk; I just drove over the river near Pruitt. It is beautiful. It looked much like Long Pool with milky blue water with big boulder edges. I suppose I missed out here, but I really wanted to get to Mystic Caverns. I’ll have to return. My final scenic stop of the day (before using the wi-fi at McDonald’s in Harrison and then driving another hour or so toward Thayer, MO where the Reader’s Digest scenic drive begins tomorrow) was Mystic Caverns. I took a guided tour in one of the two caves as I didn’t want to leave the dogs in VANilla too long. 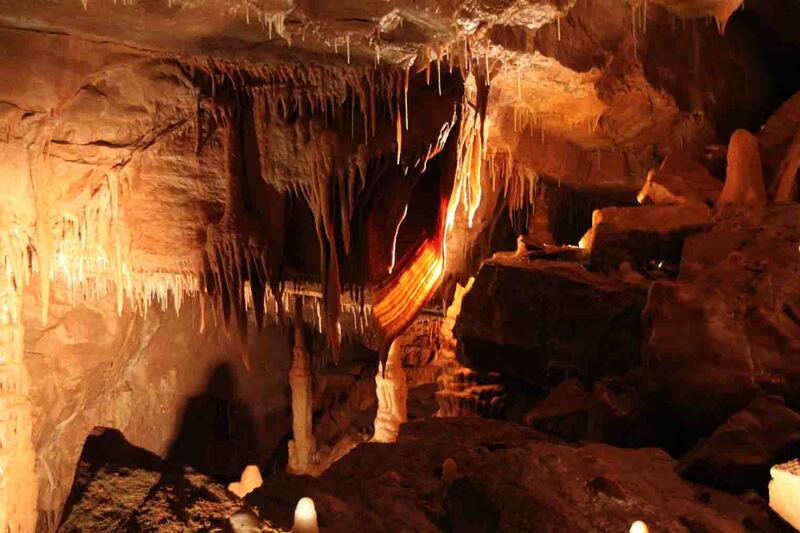 Mystic Cavern was discovered in the 1800s while the Crystal Dome Cavern, without a natural entrance, wasn’t discovered until 1967 when some workers were excavating some dirt and found it as they cracked the top. The Crystal Dome Cavern has a spring in it that feeds into the Buffalo National River (the first National River by the way), so during strong storms when the river floods, it fills up with water. Uniquely, it is right next to the Mystic Cavern, but there is an underground barrier so Mystic Cavern doesn’t flood. The cave includes calcite formations called soda straws that are very new (meaning maybe a 100 years old), cave pearls, and sawtooth draperies just to name a few of the formations. One of the ladies who works at the caverns wants to go RVing full-time and told me about a website called Escapees. It is a forum for full-time RVers. I’ll have to check it out so I know all the cheap places to camp, which local mechanics to use (hopefully none), and learn other tips and tricks of the trade. I’m assuming a “cache” or “geo cache” is something other travelers leave? Also, “red sky in the morning, sailer take warning; red sky at night, sailer’s delight”! Yep, Mom is very happy that you took your bear mace! Good girl! Looks like you’ve been seeing lots of neat sights so far. I’m glad you didn’t have to use the bear mace! So far I only briefly used it on myself when I dropped the can…that was nice experience. I would hate to have it sprayed directly in my face! Thank you for sharing your adventure, I can live vicariously through you. So the boat dock … did you start singing Otis Redding’s “Sitting on the Dock of the bay”? What a nice sunset! Thanks Mary…hope all is well in Higher Ed! I am tuning in too late since you have already passed my “roots”- lands. ‘Would love to have been a help. Looks like you are doing pretty well! Those berries are from the “American Beauty Berry Bush” found in the woods of the Ozarks, wild and rarely found in residential settings. I am racing on to today ( Sept 19th) in hopes I can find out if you are still in southern Missouri.